There was plenty of prognostication before Macworld Expo and opinionation afterward, but here at PC World, we know you care more about how a product performs in actual use. 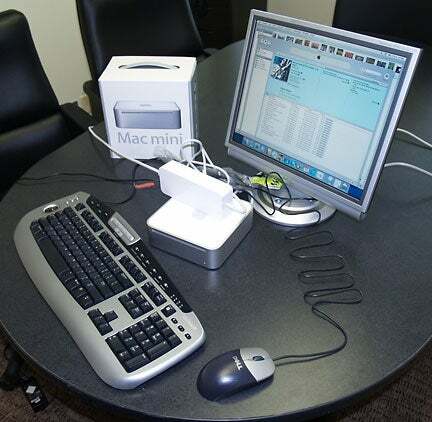 And today we got to try out a shipping Mac Mini, Apple's new, entry-level desktop system. And the Mini is a solid little (emphasis on little) machine: If I didn't love my G4 PowerBook so much, I'd be very happy to have a Mac Mini on my desk, and I can't quibble with the price. The test unit that Apple sent us has 512MB of RAM (DIMM), plus built-in 802.11g Wi-Fi and Bluetooth. These extras bump the price up to $703 from the base of $499, but that's still a reasonably good deal. This system has the same advantages and drawbacks as a typical notebook (except it doesn't have a screen). On the plus side, it's extremely light and portable, and fits unobtrusively into lots of different environments, unlike a typical tower system. On the minus side, it's relatively difficult to upgrade, and you can quickly clutter up your work space with external peripherals. And its external power brick is about a quarter of the size of the box itself. Sure, the box is tiny, but look at that power brick. After bringing your own monitor, keyboard, and mouse, you'll want to add a USB hub of some sort. Since the Mac Mini has only two USB 2.0 ports--one of which must be used for the keyboard--you'll have exactly one port left for connecting peripherals. And if you can't plug your mouse into a hub on your keyboard, you'll have none. I can imagine that the Mac aftermarket will soon have quite a few accessories with a Mini-like look, including hubs, external hard drives of the same dimensions as the Mini, and sleek, clean-looking KVM switches, to let people use the same peripherals they have for an existing system. It would be quite easy to stack this little box on top of a machine you already have. Though it's small--more compact than the average lunchbox--this system isn't rickety. It handled most tasks I tried gracefully, without hesitating or freezing. The 512MB of RAM and the solidness of OS X 10.3 have a lot to do with that, but the 1.25-GHz G4 CPU also makes a difference. 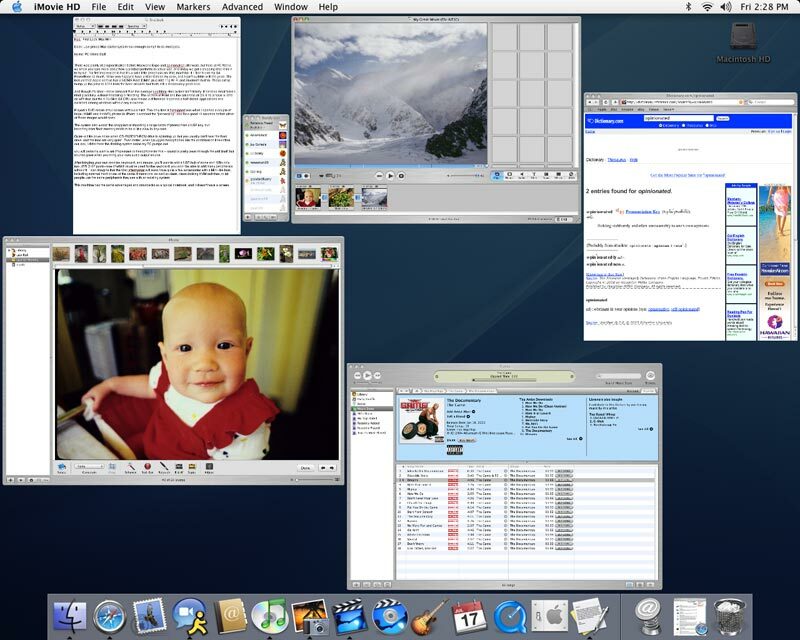 I opened half a dozen applications and switched among their various windows without any slowness. The Mac Mini also played a DVD movie at full screen without a hitch, although you will certainly want a set of speakers or headphones to use with it: The sound through the built-in speaker was way too low on my movie. But the audio sounded great through a decent pair of headphones connected to the audio port. If you want to bring audio into the Mini, you'll need to spring for something like Griffin Technologies' IMic, which connects to a USB port. The only time this Mac Mini hiccupped was when I opened a couple of large (15MB and 111MB) photos in IPhoto. I watched the "processing" icon for a good 10 seconds before either of these images would open, and switching among photos was a little sluggish. The system also wasn't the snappiest at importing a large batch of photos from a USB key, but importing from flash memory tends to be a little slow in any case. The Mini switched among a half-dozen apps without hiccupping. It ran about as hot as Mac notebooks tend to--I could feel heat coming from the back vents and from the bottom after about two hours of use. One pleasant surprise was how quiet the Mini is: I heard a little drive noise when the CD-RW/DVD-ROM drive was spinning up, but I usually didn't hear the hard drive, and the fans are very quiet. Even better, when I plugged headphones into the combination line-in/line-out jack, I didn't hear the droning system noise my PC pumps out. My bottom line? If I were recommending a starter system to someone (who hadn't already taken a side in the Mac versus Windows holy war), I wouldn't hesitate to send them in the direction of the Mac Mini. Senior Editor Rebecca Freed writes PC World's Mac Skeptic column.